On Wednesday, Page 2 ran its list of the worst current baseball stadiums. We asked for your take, and you filled our mailbag with plenty of opinions. 1. 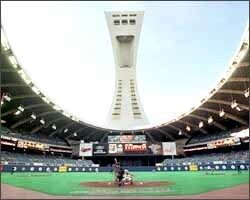 Olympic Stadium: It looked drab and dreary when Andre Dawson and Gary Carter played there. So, was it ever cool? 2. 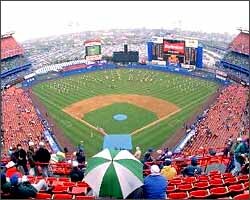 Veterans Stadium: Ugly, but the turf does remind some players of their childhood days of playing stickball in the street. 3. Tropicana Field: Nothing like being forced to go inside to watch baseball on a beautiful sunny day in St. Pete. 4. New Comiskey Park: A monstrosity trapped between the ageless classics and the new wave of retro parks. 5. The Metrodome: As a general rule, building an outfield wall out of a hefty bag doesn't add to the ambiance. My brother and I went there for a game back in 1994, and it was about 100 degrees outside the stadium -- meaning it was about 140 degrees inside the stadium. The whole place smelled like rotten meat, which actually saved us a couple of bucks since we decided to pass on the concessions. Back then, they had those metal railings on the seats, so we couldn't recline back or else we'd get burned. It was like watching a baseball game in hell. 8. Ugly on the outside and in. 9. A need for a courtroom in the basement -- need I say more? The Vet is absolutely the worst stadium in the majors. It is a concrete prison (with an actual courthouse and temporary jail) where good baseball goes to die. They did address the turf problems with that new turf, but that's kind of like putting a nice little bow on a pile of dog crap. Thank God the end is near for this hellhole. It's gotta be the Vet. 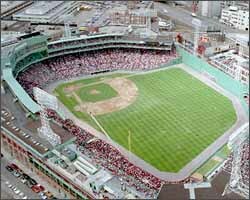 Take the neighborhood of Fenway, drop in acres of asphalt like the Murph, craft a perfect circle like Riverfront, fill the seats with a few dozen fans, like at Olympic, stick in the turf of Tropicana (an improvement over the green concrete, I'll admit), creatively decorate it like Three Rivers, and offer worse concessions than your average Little League game. You get a stadium with all the ambience of an airplane hangar, without the noise. The Metrodome is the worst baseball stadium. Actually, let me rephrase that, the Metrodome is a good football stadium and the Monster Truck rallies do pretty well in there as well. Bottom line: it's not a baseball stadium. The seats are all positioned to watch football. Good baseball stadiums have waterfalls and swimming pools in the outfield; the Metrodome has blue football seats folded up. 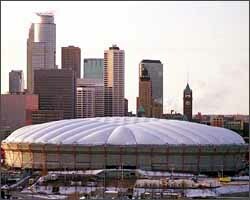 Those other stadiums might be pretty bad too but they can't be any worse than the Metrodome. Baseball wasn't meant to be played in a Glad bag. It's plastic run amuck. Plastic seats, plastic field, plastic ceiling, plastic walls. Even the food tastes like plastic. And I haven't even gotten to the lighting problems. Have you ever sat in the stands watching a baseball game, minding your own business, and watch a foul pop disappear from view because the roof's color is the same as a baseball? And if you think you as a fan have it bad, pity the poor (wealthy) players who have to look directly into home plate, try to find the batter, who's illuminated with light that make flashlights look bright, and then look for the baseball, especially when it's in the air. No wonder so many fielders wind up on the bottom five plays, it's because they're playing on the bottom one field! You just cannot play baseball in a stadium constructed for something else. I've been there once, for a playoff game in 1981, and even though the fans were excited and were cheering, we were so far removed from the field that the excitement couldn't be felt on the field or all over the stadium. I think back then the fans got a bad rap because of the stadium -- we were cheering, but no one could hear. Where do we begin? It's crumbling beneath us. It's supposed to have a retractable roof. It looks just plain horrible on TV. Even God doesn't like the stadium. He tried to put lightning through it twice and still couldn't get rid of the damn thing. It has everything that is anathema to good ballparks: multipurpose design, rock-hard artificial turf, tons of concrete, and horrible sound all contributing to a place with all the warmth and charm of Carlsbad Caverns. A horrible place. Walk into Tropicana Field and you feel like you're in a giant warehouse. How many disputed home runs will there be each season because of the catwalks? Sit toward the outfield on either line and turn to look at home plate and all you see is heads in your way. The security kicks you out if you heckle the other team's players, the service staff is rude and Vince Namoili complains that it's the fans' fault the team stinks as he charges me almost seven bucks for a beer, and 10 bucks to park and walk almost a mile to the ballpark. No wonder why the attendance is low. Everything associated with Tropicana Field stinks. Do you need to ask why? Spring training games are held at Al Lang where you can watch a game and watch sailboats and palm trees sway in the wind. Games in the Trop are like watching baseball in a warehouse. 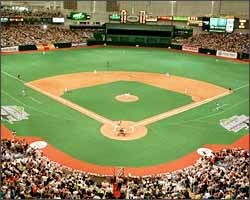 The Trop is by far the worst baseball stadium in the league. It's basically a gigantic pinball machine. If the ball isn't hitting a support ring for the roof, it's hitting an empty seat. It's too bad that some type of retractable-roofed stadium couldn't be constructed. Maybe that would give the fans something to talk about, or cheer about for that matter. Unless the Tampa Bay Expos can get some fans in the seats, we won't have a team to put in that giant library. Note to Tampa Bay D-Ray fans ... Make some noise! Just because we're stuck with the worst stadium in baseball, doesn't mean that we have to be the worst fans in baseball. 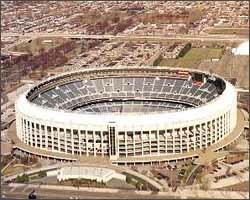 Berman fell in love with football when he watched the Jets play at Shea Stadium. 1) Those God-awful neon figures on the outside. 2) The view of ... nothing. Manhattan is behind home plate. Terrible. As someone who grew up in New York, I'm embarrassed that one of the nicest cities in the world has the ugliest baseball park. One has to look no further than the "Magic Hat" in center field. Yeah, it was cool back in the '70s or '80s (whenever it was built), but so were Jordache jeans with a brush in the back pocket and Capezio shoes. Not to mention the nondescript scoreboard. And every year there is an attempt at a "Band-Aid fix" (banners on the outfield wall, faux bleachers, picnic area) but what the stadium really needs is "Six-Million Dollar Man" surgery. "Hey Mayor Giuliani, I know you are a Yankees fan, as am I, but how about, for the good of the city, helping out those folks in Flushing" (which sounds like a good idea to do with Shea). Did I mention the state-of-the-art (20 years ago) Diamondvision? While I have been to many of the worst and seen the rest on TV, Shea really is bad. Planes are constantly flying over and the stadium is next door to a bunch of junk yards. Part of the beauty of going to a stadium is the neighborhood ambience. Shea has none. 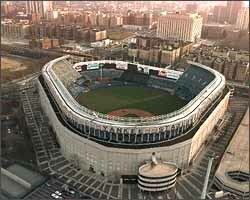 It is a typical box stadium built in the 1960s and 1970s that needs to go the way of the rest -- blow it up! Comiskey Park for all the right reasons, it's located in the worst part of town that no one wants to drive to and leave their car anywhere near. Which means you park on the north side and take the train down. It's background view is of the city's public housing facilities which are drab and dreary. The upper deck makes you feel like you're sitting a mile above the action and the players look like dots. It has none of the new amenities of the newer ballparks that were created a year or two later and it's overall just an awful experience. I still love the Sox, but the fans here in Chicago were just robbed by Reisendork. It is by far the worst place to see a game. Especially the upper deck. The reasons are: The upper deck is so slanted, you get vertigo just going to your seat. The color of the concrete is the same color as the ball, and you lose the ball on pop-ups. The upper deck doesn't allow you to see the ball as it goes into the corners. If you are sitting in the upper deck, you still have to look down on a pop-up. The arc of the ball is still below the start of the upper deck. Plus, they designed the exterior of the park to look like Ebbets Field, however, they then put up walk ramps to cover the facade, so it looks nothing like Ebbets. Good idea. The New (ugly) Comiskey Park may not be the worst stadium when you look at places like the Vet, the Metrodome or Riverfront (I hate corporate nametags), but it's by far the most frustrating of the bunch because of that word "New" in its title. Opened just 10 years back, this place looks like one of the hundreds of strip malls out in Chicago's vast suburban sprawl -- and that's not a good thing. So many things are frustrating about the South Side Mall, but I'll name the top two reasons I think it's one of the worst. First of all, the blue that's everywhere. Yes, the blue seats and outfield walls work in Yankee Stadium, but Yankee Stadium this isn't. They spent $8 million over the winter to renovate the place, but if they would have just gone to Ace Hardware and picked up a large quantity of green paint, it would have done wonders for the drab quality that overpowers Comiskey when it's less than half full (which is always the case). 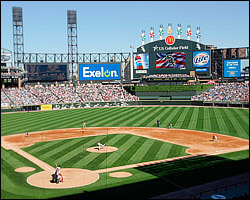 Secondly, and this was their biggest oversight in my mind, New Comiskey faces the wrong way! Chicago has the most beautiful skyline in the country and what do they do? They built this place to face southeast, leaving the poor saps that brave the treacherous upper-deck with a view of the lovely, awe-inspiring projects! Are you kidding me?! If only they could uproot the whole stadium and rotate it 90 degrees and then pay some of the neighborhood kids to spray-paint all of the seats green, we'd all be much better off. Old Park. No decent parking available. Ballpark is too small, impossible to get decent tickets to see any good teams. Green Monster is overrated. Highest-priced tickets in the game. Most memories are bad ones. Frustrated and nasty fans because they have no World Series since 1918. Just build a new ballpark and get rid of that pile of junk. I have been going there for almost 50 years, it's time for a change. Its so cutesy and gimmicky. That left-field porch has got to go, it makes a joke out of the home run. It takes cute little pieces here and there and tosses them into one big carnival freak show, not a baseball stadium. Sure the ambience is nice, but try getting to your seats in the hallways made for little old Italian ladies. You have to be 5-2 to fit down those hallways. I'll show up at Shea and "Meet the Mets!" What was once a very respectable park has now turned into some baseball-football stadium hybridization eyesore. Al Davis' and the Raiders' return to Oakland brought about a shameful colossus of seating nicknamed Mount Davis. Absolutely wrong.